The deformers can only be scaled along the centre axis to adjust the length of the limb. 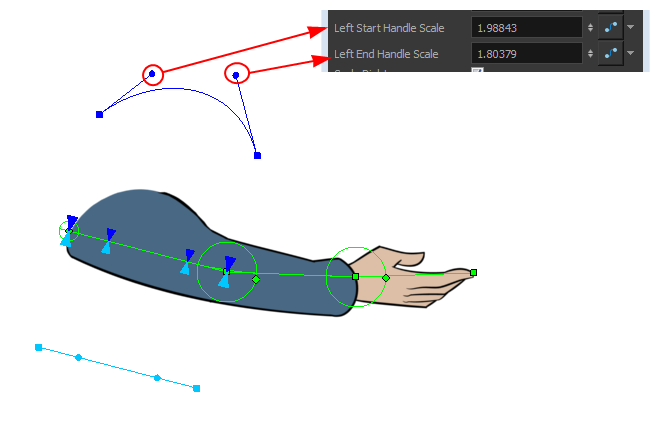 The Deformation-Scale can be used in combination with a Bone or Curve deformer to scale a drawing so it follows the opposite direction of the deformer axis (the width). For example, when combined with function curves this can be used to create advanced muscle effects. All these settings can be animated over time. In the Node view, navigate to the node to which you want to add a Deformation-Scale effect. In the Node Library view, select a Deformation-Scale node and drag it to the Node view. Connect the Deformation-Scale node directly under the lower deformer node of your chain. In the Node view, select the Deformation-Scale node and select View > Show > Control to display its controls in the Camera view. Click on the square yellow button of the Deformation-Scale node to open the Layer Properties window. 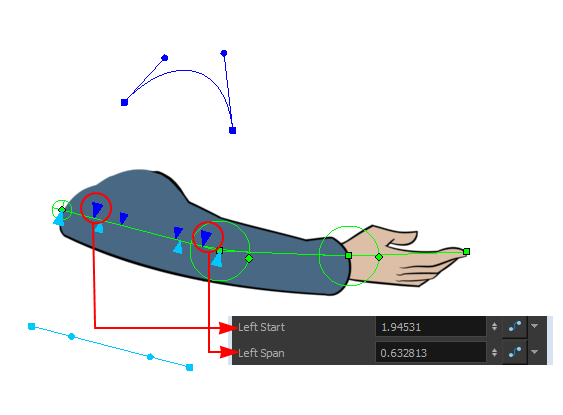 You can animate the different parameters of the Deformation-Scale node by enabling the Animate mode in the Tools toolbar and adding keyframes. In this case, different values will be connected to functions. NOTE: If the controls are too far away from the deformer, you can change the default display of the Deformation-Scale and Deformation-Uniform-Scale controls in the Preferences dialog box to bring them closer. Enables or disables the selected node in the Camera, Timeline, and Node views. Changes the node and layer colour. This series of options controls the left scaling deformation. Scale Left This option is enabled by default. It allows the left side of the deformer to be scaled. In the Camera view, the dark blue controls are used for the left side. If you disable this option, the controls will be hidden and no scaling deformation will occur for this side. Left Fade In The value is set to 0 (no fade) by default. Increase the value to add a fade effect to smooth the transition between the starting point of the scale and the area before it. Left Fade Out The value is set to 0 (no fade) by default. Increase the value to add a fade effect to smooth the transition between the Left Span point of the scale and the area after it. Defines the starting point of the left scale deformation. The default value is 0 and represents the Deformation-Root. Each main control point count for +1. 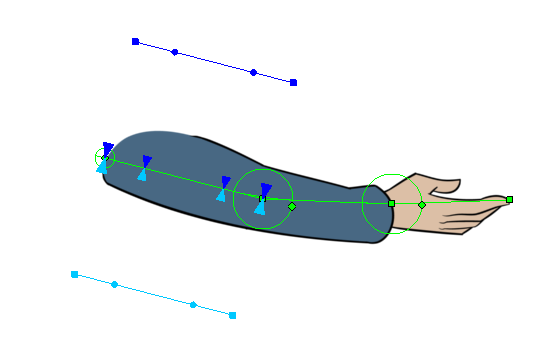 Move the first blue arrow along the deformer’s central axis to set the starting point of the Deformation-Scale and the last arrow to set the length (span) of the transformation. Left Span Defines the length of the left scale effect. Defines the start of the left scale effect. Drag the square scaling curve control points away and forward from the deformer axis to set the scaling value at the starting and ending point. Left End Scale Defines the end of the left scale effect. Defines the starting position of the left handle. 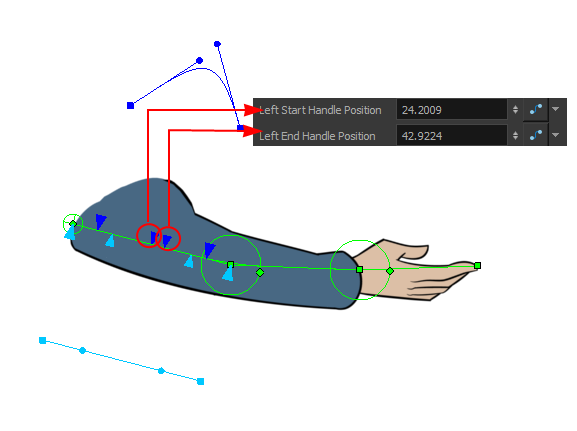 Drag the two middle blue arrows along the deformer’s centre axis to set the position of the curve handles. Left End Handle Position Defines the ending position of the left handle. Defines the starting position of the left scale handle. 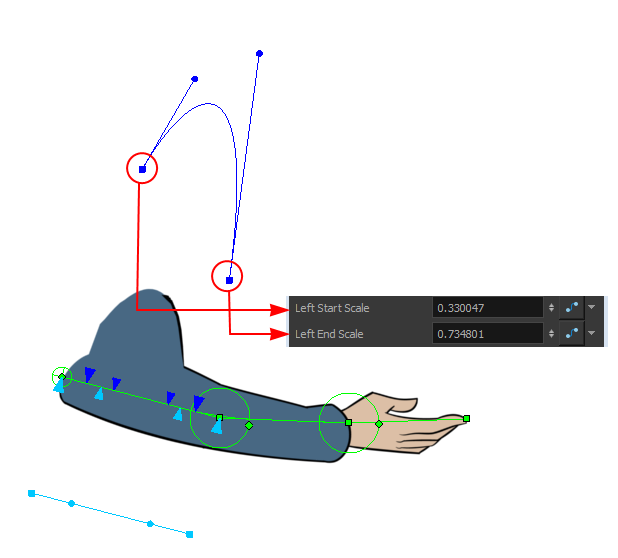 To modify the scaling value of the curve, drag the two control handles away and forward from the deformation axis. Left End Handle Scale Defines the ending position of the left scale handle. Scale Right This option is enabled by default. It allows the right side of the deformer to be scaled. In the Camera view, the light blue controls are used for the right side. If you disable this option, the controls will be hidden and no scaling deformation will occur for this side. This option is disabled by default. It means that the left and right sides will use different scaling parameters. If you enable this option, the right side controls will be hidden in the Camera view and the left parameters will be used for both side for a symmetrical scaling effect.